^^With never-been-told, behind-the-scenes stories from the skating world, personal challenges including testicular cancer and a brain tumor, as well as divine miracles, Olympic Gold Medal figure skater Scott Hamilton shares the secrets to his lifelong journey to find the silver (and gold) lining in the clouds of life. His life principles, fashioned into eight secrets that begin with the rote of learning to skate the figure 8, are the keys. Scott says, "Skating taught me how to be happy. I have always kept these eight as my own private, personal secrets that I practiced daily with repetition, focus, and discipline. Now I want to share them with the world." ^^"For the past twenty seven years Scott Hamilton has been a mentor and good friend. I've seen first hand the struggles he has had to endure and how he has continued to persevere with a confident attitude. He lives his life as a champion. Everyone needs the positive message of this greatly inspiring book." ^^"I know and love Scotty Hamilton. You will too after you read this book." 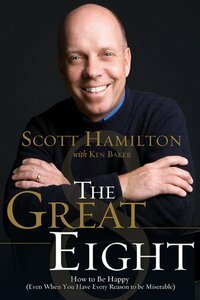 Scott Hamilton is a New York Times best selling author, an Olympic champion, cancer survivor, broadcaster, motivational speaker, husband, father, eternal optimist, and firm believer that the only disability in life is a bad attitude. For more than twenty years, Scott has inspired audiences at numerous events throughout the country, speaking to a wide variety of groups and organizations about his life and overcoming adversity. He lives outside of Nashville with his beautiful wife, Tracie, and their four amazing children.